Even labels that don’t brand themselves as environmentally friendly are finding reasons to minimize their footprint. 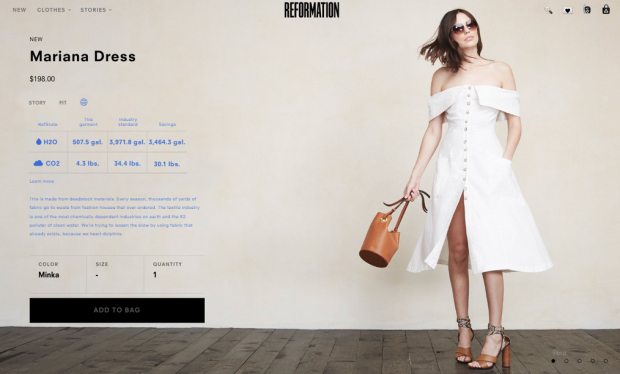 A look at Reformation’s new “Refscale” page. Photo: Courtesy. As a manufacturer of denim, Siwy COO Alain LaFourcade is always looking for ways to reduce the hundreds of gallons of water needed to produce a pair of his made-in-California jeans. (The state’s unprecedented four-year drought has forced apparel companies to address their consumption rates.) For Siwy, the current answer is to use specialized laser and ozone wash machines, which require less water than the standard machines. But while its actions could easily fall under the label of environmentally responsible, you’d be hard-pressed to find a consumer who thinks of Siwy as an eco-friendly brand. Yet it’s just one of hundreds of fashion companies currently making changes in order shrink its environmental footprint. A decade ago, that wasn’t the case. Before buzzwords like “sustainability” and “conscious consumerism” were a thing, “eco-friendly” fashion was the talk of the town, often consisting of crunchy, hippie-ish wares made of rough organic cotton and designed with your lavender-scented yoga studio in mind. Back then, there was also a lot of talk of “greenwashing,” or the idea of marketing something as eco-friendly without evidence to back up the claims. While a few legitimate fashion labels were willing to take a stance — most notably Rogan and Loomstate — most stayed as far away from the association as possible. “I think consumers do care and I think they are starting to care more and more,” says Yael Aflalo, founder and CEO of Los Angeles-based fashion line Reformation. Just in time for Earth Day, Aflalo has launched Refscale, an environmental footprint tracking program. From today on, every product on Reformation’s website will include information about the amount of carbon emitted and water used in order to produce the garment, as well as the industry averages for comparable items. (Aflalo used an outside sustainability firm to vet the numbers.) For instance, the brand’s new $168 Nashville dress, made from deadstock fabric, required 235 gallons of water to make and emitted 3 lbs of carbon dioxide. (The “industry standards” for a similar garment is 1,839 gallons of water and 18 lbs of Co2, says Reformation.) The company has also introduced the “Low Carb” collection, which features items made with the smallest footprint possible. “Many brands don’t even know where their production is taking place,” says Zady co-founder Maxine Bedat, who worked hard not only to find the right partners at every step of the supply chain, but to also help foster relationships between those suppliers. Users will be able to follow the process — from farm to dye plant — via Zady.com, which Bedat says has become as much of an information source as it is a shopping destination. For instance, the company is spearheading the U.S. efforts around April 24’s Fashion Revolution Day, which honors those killed in the Rana Plaza disaster by challenging the fashion industry to create a more transparent global supply chain. “We’re really at this educational phase,” Bedat says. While brands like Zady and Reformation are proud to wave the eco-friendly flag, it’s not only about the goodwill initiatives like these generate. Making environmentally sound decisions can also save a company money. Last week, the Natural Resources Defense Council (NRDC) released a report detailing the sustainability efforts of more than 30 Chinese textile mills that make fabrics for brands including Target, Levi’s, H&M and Gap. According to the NRDC, those companies are saving $14.7 million a year by cutting water, energy and chemical use. The annual return per mill averaged $440,000, with the top five performing mills saving more than $800,000. Most of those mills are part of the NRDC’s “Clean by Design” program, which offers guidelines for reducing waste. To be sure, those sorts of numbers are just a blip to billion-dollar businesses, but for independent brands, it offers another incentive to minimize environmental impact. “Coming up with alternative ways to wash our denim has helped us save on production costs,” LaFourcade says. All good intentions aside, a healthier bottom line might be the only reason a brand needs to embrace the “eco-friendly” moniker. 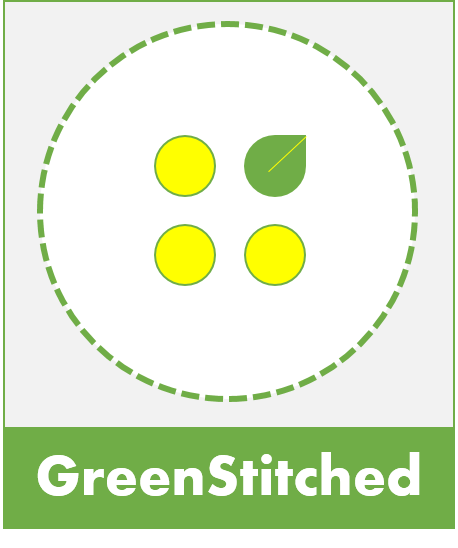 This entry was posted in Brands and tagged Brands, carbon footprint, Sustainability Report.